Today we’re launching ALPHA 5 of All Walls Must Fall: DAILY CHALLENGES! As well as the headline feature, this update has mostly been focussed on polishing and balancing a few things about the game. For the full patch notes, click here. The biggest new feature this time is a brand new game mode: Daily Challenges! Every day, we generate a new mission, the same for everybody across the world. 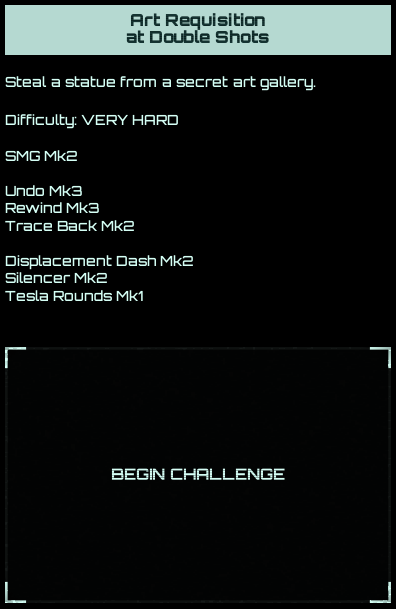 It’s taken from our pool of regular campaign missions, but with a randomly generated loadout and difficulty level. The inbetweengames team will be competing alongside you all as often as we can! Follow the inbetweengames twitch account to be notified when we stream our attempts! As part of the ongoing animation push, we’ve added new player animations for shooting and dashing, as well as improved the walk cycle and added poses for being in cover. There are also new sound effects for enemy weapons, as well as tweaks to the player weapon sounds, and extra sounds for UI feedback. The campaign has had some small adjustments for this update also, as we’ve heard from some of you that with the RPG elements update, the player could get a bit overpowered and make the campaign too easy in some situations. While things are still far from final, we’ve tweaked the health pool of enemies a bit, as well as their spawning patterns. There’s also a new Nemesis enemy type, though that’s very much still a work in progress - we want to add specific abilities for some of the enemies, which will hopefully come in a future update. We’ve also adjusted the way missions unlock during the campaign. To make the initial experience a bit more consistent, now the first three missions of the campaign will be linked together, and the campaign map will only be unlocked after those three are completed. WAIT, WHAT? WHO GAVE YOU ACCESS? Thanks for everyone who’s been giving us feedback about dialogues! We’ve added more variety to some of the backroom dialogues to make them a bit less predictable and hopefully more understandable.